A restored Spanish and Mediterranean-style mansion in Palm Beach, known as Villa Tranquilla, just sold for $36.15 million, property records show. West Palm Beach-based entity 640 Palm Beach LLC bought the 11,735-square-foot mansion for $3,080 per square foot. Attorney Larry B. Alexander, chairman of Jones, Foster Johnston & Stubbs P.A., represented the buyer. Property records show the one-acre estate at 640 South Ocean Boulevard was sold by Ocean Place Properties LLC, a limited liability company led by energy businessman Larry J. Gelber. Cristina Condon of Sotheby’s International Realty was the listing agent, according to the brokerage’s website. She acquired the listing in September 2015. At one point the mansion was listed as high as $42.9 million. Records show the waterfront mansion was originally built in 1928 by architect Addison Mizner. Architect Jeffery Smith of Smith Architectural Group was behind the renovations and restoration of the estate, which took more than three years to complete and were finished in 2014, according to the listing. In 1996, the mansion was designated a landmark, meaning any changes to the mansion’s original exterior look must get approval from the Landmarks Commission. The eight-bedroom, nine-bathroom and three-half bathroom house features include a deck, patio, library, theater and pool. Its interior has granite countertops and hardwood and tile flooring. Records show in 1996 the mansion at the corner of El Brillo Way was owned by the late oil and pharmaceutical tycoon Cheng Ching Wang, father of fashion designer Vera Wang. Vera Wang and her brother Kenneth Wang sold the home in 2008. Residential sales in Palm Beach County in May increased by 5.8 percent to 3,188 from 3,012 the previous year, according to the Realtors Association of the Palm Beaches. Just this month, Billionaire George Lindemann and his wife Frayda sold their oceanfront house at 1565 North Ocean Way for $25.2 million. 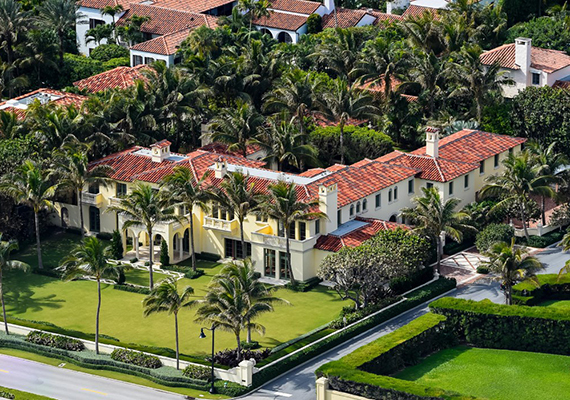 Other nearby notable sales include the newly completed 1.5-acre property at 101 Indian Road that sold for $49 million –marking the most expensive home to trade in more than a year in Palm Beach County.